In the early 1960’s, Dr. Frank Belgau, working in the classroom with children with reading problems, began carefully experimenting to see if he could find activities that made an immediate observable improvement in the children’s reading and academic performance. The procedure was simple and straight forward - the children read a passage orally, they did ten to fifteen minutes of motor skill sensory integration activity, and then read a different passage from the same story. He listened to and compared the two reading samples. He also asked the students to report any differences they observed themselves. He found activities that made a difference in reading and in vision. He moved to the University of Houston where he directed the Perceptual Motor and Visual Perception Laboratory. Here he continued and refined his observations. At the University he directed a parent training program in which parents and children spent 1 1/2 hours twice a week for a month working to overcome their reading and learning difficulties. Many of the parents in those programs were scientists associated with the NASA space program. 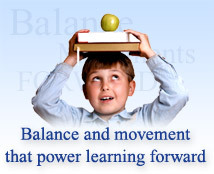 Their insights helped to direct his attention to the effect of balance and the vestibular system on learning processes and, to the development of the Belgau Balance Board. Since then he has observed the effect of activities done on the Belgau Balance Board with his own children and with children in many school programs in this country and in Japan. The results have been astounding! Because most learning disabilities are caused by sensory integration disorders, Dr. Belgau developed The Learning Breakthrough Program. The Learning Breakthrough Program is the result of the observations and interactions over many years. It’s foundation is the Belgau Balance Board and it includes those materials and activities that he has found to be the most effective and most powerful in showing a consistent improvement in reading, academic achievement and in developing intelligence.